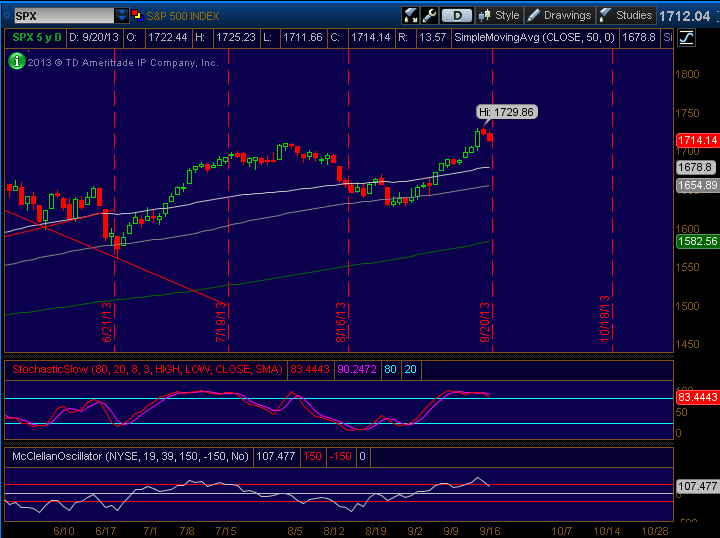 SPX was around 1714 at the time and the VIX at 13.31. This is the first position of the November expiration cycle. What was your rational for opening the November SPX trade today? This looks like a sold position. I would have done the same position but perhaps give myself 5 more points on the upper leg to 1805/1810. Good luck and good trading. Just staying mechanical and opening the first trade exactly 8 weeks from expiration. No other rational behind it. May be I miss something, what is the purpose of mentioning 77% probability? The loss vs reward is 5.25:1. Probability of loss is 0.23. Long term, for every 4.37 successful trades there will be one with a loss of 5.25 x reward of a one successful trade. By probability definition the trade is losing one. f it is traded on 77% success this is statistically losing trade = gambling. Nothing wrong with gambling per se, but I think there are better strategies to gamble than iron condor. Most of the time, when selling credit spreads that's what happens. The probability of success is slightly lower than the risk/reward, or if pricing is perfect they would be the same. And you would call that gambling too. Specially this year with implied volatility so low that is surely the case you will find. Are you a seller of options? Can you share some constructive knowledge? What strategies are you using in this market? Long call? Long put?